Your dedicated safari guide will be waiting to warmly welcome you and discuss your interests and expectations for your safari. You will receive a full safari briefing. Once you have become acquainted with your guide you will depart in a safari vehicle and drive south to the Serondela area. 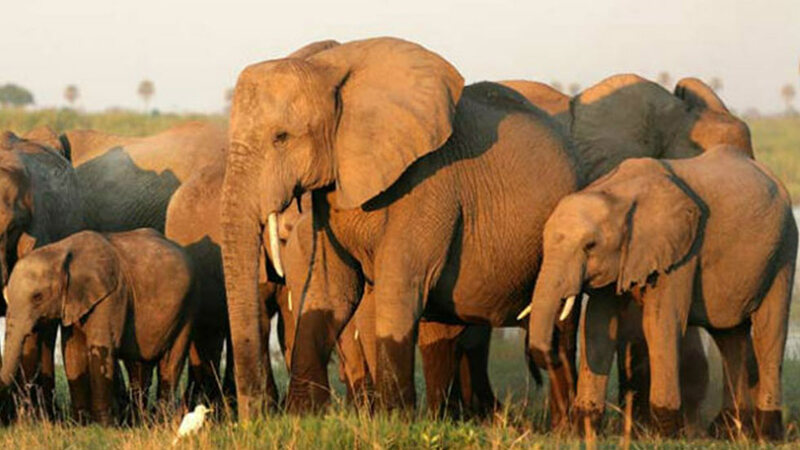 This is the heart of elephant country and you may spend hours watching the huge herds in and around the Chobe River on game drives or private boat cruises. 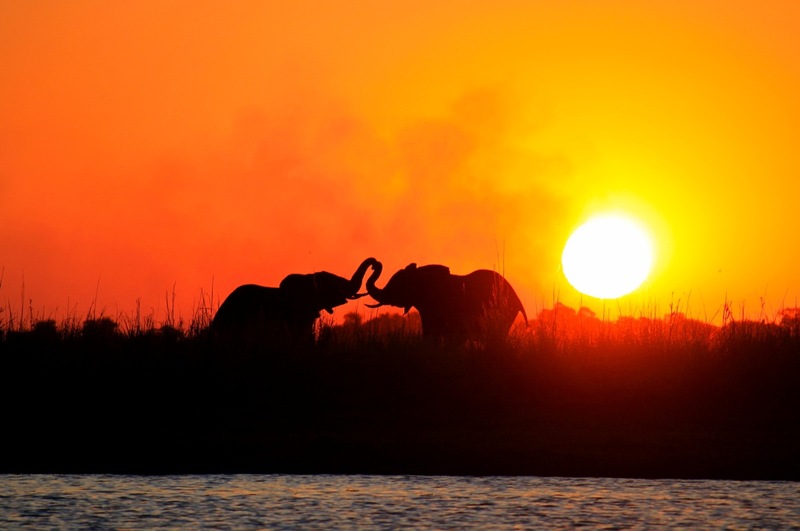 Northern Chobe is renowned for its large variety of bird and animal life, beautiful scenery and magnificent sunsets. The safari is a fully serviced camping experience with guests accommodated in comfortable domed tents with private bathrooms, each featuring an en suite flush w.c. and al fresco bucket shower. Similar accommodation will be enjoyed for the duration of your guided camping safari. Today you will travel from Northern Chobe (6–8 hours overland game drive) to the Savute region where you will camp for two nights in this spectacular and intense landscape. Renowned for lion and other predator viewing, the landscape around Savute is starkly beautiful. Mopane forest gives way to acacia savanna with rocky outcrops. The mysterious Savute Channel, which dries up periodically, has recently begun to flow for the first time in more than two decades and has proved an irresistible attraction for a high concentration of wildlife. Today you will travel from Savute to the Khwai region (5 – 7 hours overland game drive) where you will camp for 2 nights. 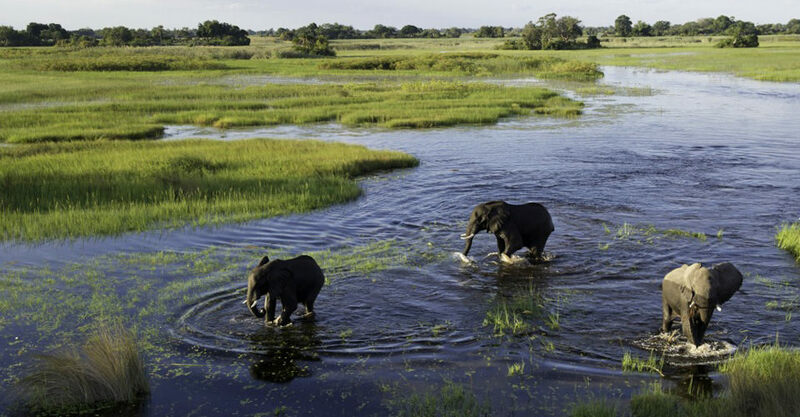 Adjacent to the Moremi Wildlife Reserve, the only proclaimed wildlife area in the Okavango Delta, the Khwai concession encompasses a stunning landscape of forests, lagoons, floodplains and islands, with rich wildlife. Game viewing is excellent year-round and resident species include lions, cheetahs, leopards, elephants, wild dogs, zebras, red lechwe and many more. Spend two nights camping on the concession, with extensive game drives taking up your days. A short, scheduled flight in a light aircraft will take you from the Khwai airstrip to an airstrip in the Okavango Delta from where you will be transferred to the campsite. A maze of sparkling lagoons, meandering channels and overgrown islands, the Okavango Delta is the world’s only inland delta. Crystal clear channels spread over the Kalahari Desert with their papyrus-fringed banks and fertile floating islands. 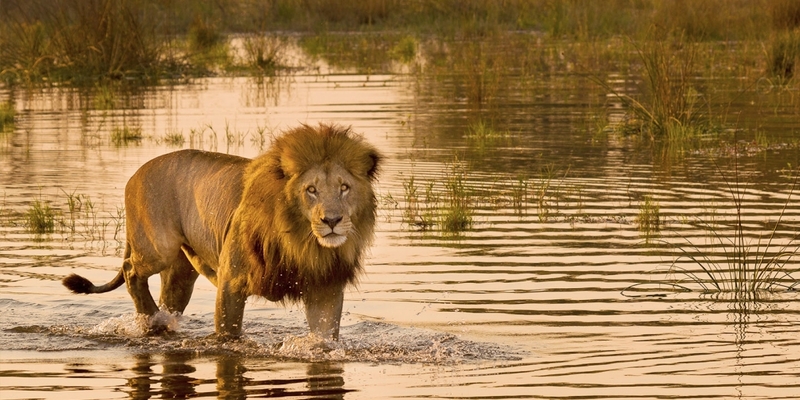 Elegant red lechwe and sitatunga are found in this watery wilderness, while lions and leopards share the floodplains with giraffes and elephants. Hippos inhabit the deeper channels and lagoons, where iridescent dragonflies, frogs of every colour and jewel-like kingfishers live in the lush banks. Spend two nights at the campsite in a private concession area bordering the Moremi Wildlife Reserve, with a complement of camp staff to cater for your needs. Explore the crystal-clear channels, islands and waterways by mokoro (dug-out canoe) and enjoy nature walks and game viewing on the islands. A short, scheduled flight in a light aircraft will take you to Maun Airport. 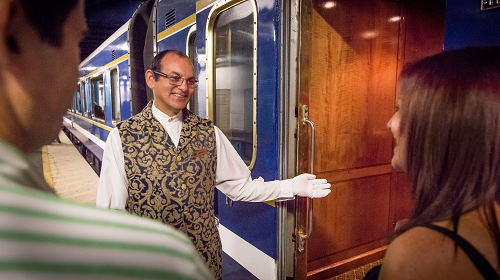 Here the trip will come to an end and you will be able to continue with your own arrangements. ⇒ On a private basis (min of 2 persons to operate) $ 5 050.00 pp sharing or $ 7 000.00 pp single rate. ⇒ On a scheduled basis (min of 4 persons to operate) $ 4 550.00 pp sharing or $ 6 300.00 pp single rate. ⇒ On a private basis (min of 2 persons to operate) $ 4 890.00 pp sharing or $ 6 920.00 pp single rate. ⇒ On a scheduled basis (min of 4 persons to operate) $ 4 400.00 pp sharing or $ 6 230.00 pp single rate. ⇒ On a private basis (min of 2 persons to operate) $ 7 590.00 pp sharing or $ 10 780.00 pp single rate. ⇒ On a scheduled basis (min of 4 persons to operate) $ 6 770.00 pp sharing or $ 9 760.00 pp single rate.